Twitter can be a great tool to promote your event, encourage networking before, during and after, and share key messages with people who aren’t attending on the day. If you are going to use Twitter for your event it’s best to start planning fairly early on, so here are 5 steps to getting the most out of Twitter for your event (for free). This has been written with conferences and events in mind, but is just as relevant for tweet chats. The hashtag binds the conversation and helps everyone to see all the tweets for an event without needing to follow everyone who is tweeting. 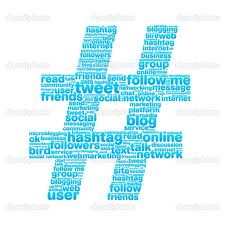 Choose a hashtag that is short, simple, relevant and not already in use. For yearly events add the year at the end, e.g. #physiotalk14. You should choose it well in advance of the event, so early on in the planning stages. This means you can register it and promote its use right from the start (see 2 & 3) and get everyone using the same hashtag. Registering your hashtag with the Symplur healthcare hashtag project makes it easy for you to produce and share analytics and transcripts. It’s a simple but effective way to keep an eye on tweets, participants and activity before, during and after an event. Click here for an example of a conference registered with Symplur. You can reach the Symplur registration page by clicking here . You can also use Symplur to check what hashtags are already in regular use, as to register with Symplur your hashtag must be unique. You can also register your conference or event hashtag with Twubs, but this is a tool for following hashtags rather than for analytics and transcripts (see 4). 3. Use, promote and encourage! Once you have decided on and registered the hashtag use it and promote it in your event literature – posters, flyers, website, and in tweets etc. Generate interest and conversation using the hashtag before the event as well as on the day. Use landscape graphics on twitter to prevent the event that include the hashtag and a link to the event webpage/information. Make sure that a team of people are actively tweeting at regular intervals from the event. This should include a mix of content – so conference programme, quotes, links to resources mentioned during the event, photos and videos. Try to @ mention speakers who use twitter where relevant. You can also think about using Periscope to live stream conference activity, or take short videos (less than 30 seconds) on your phone and upload straight to your twitter feed. The Vine app allows you to take short, 6 second, looping videos which can work well for soundbites from speakers and attendees – see examples here from the WeGetTogether. Using the right Twitter tools to follow a hashtag can make all the difference for you and for people joining the conversation. 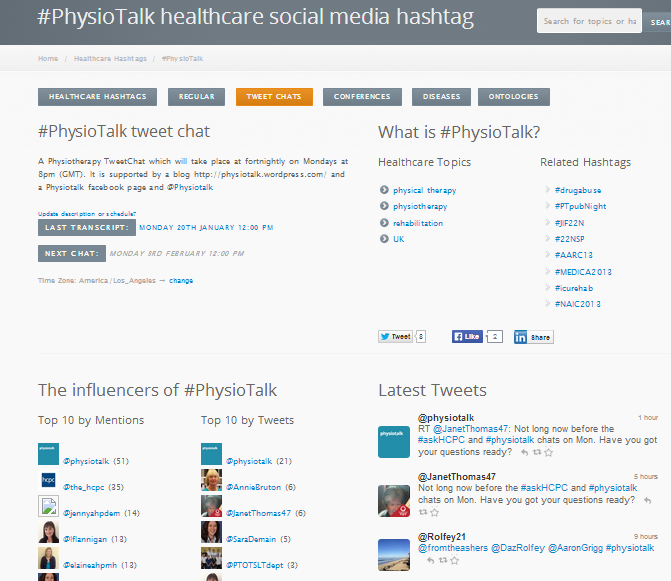 So far the #physiotalk team have found TweetDeck to be the best for fast moving discussions, but we would recommend having a go with each one to see which suits you personally. Both of these tools allow you to pre-schedule tweets and this can allow you to plan and post links and content in the run-up to the event and on the day. And of course don’t forget your phone/tablet/laptop on the day, chargers and power banks! 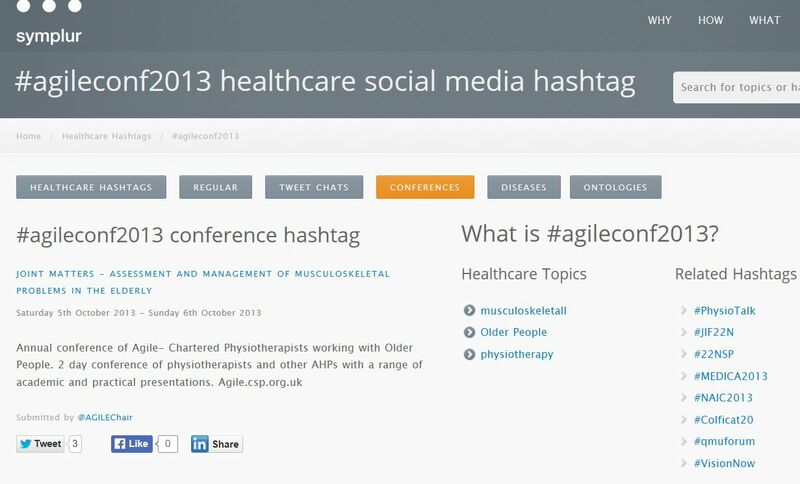 Click here for the #physiotalk landing page as an example. Once you have registered your hashtag you can use Symplur to generate analytics and transcripts at any time. This will tell you the number of impressions, tweets and participants and give you a list of all the tweets within a chosen period of time. You can choose the time frames for this, e.g. for different days or morning and afternoon sessions. This then generates a report with a unique web address/URL you can share through social media etc. The analytics and transcripts also generates pictures of the participants which link directly to their twitter profile. There are also companies that offer professional networking and social media packages for conferences, for example Leebug, but most of these will charge you to do this.